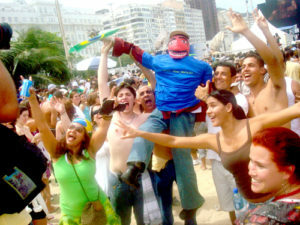 Jubilation on Copacabana beach, photo by Aarti Waghela. RIO DE JANEIRO – The cheer wasn’t quite what it could have been when it was announced to the expectant masses on Copacabana Beach that Chicago had been knocked out of the running. Maybe the feeling was that, if Obama’s adopted city and supposed front-runner could bow out in just the first round of voting, then anything could happen. Even a Madrid victory seemed possible, an eventuality that even the Iberian faithful probably had not been banking on twelve hours earlier. Speculation following Chicago’s exit jumped across the sand like confused static. “Surely Europe can’t get the games again?”, “Didn’t Spain get it recently?” But if the crowd was suddenly a little nervous, the Rio delegation on the scene in Copenhagen showed no sign of concern. A different story started to take shape across the aisle however, as grim faces on the Spanish side revealed that reality was asserting itself in the minds of those closest to the action. 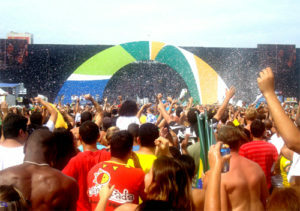 When the envelope was opened, the eruption of ecstatic celebration would surely have told anyone watching from afar that, as President Lula has said recently, the Olympic party will raise the self-esteem of a nation and give it long overdue acknowledgment and full inclusion in the world community. “Today, Brazil was upgraded from a second class country to a first class country,” he said following the announcement. Many commentators have been calling Chicago’s first-round exit one of the most shocking defeats ever handed down by the IOC; in the week prior to the vote, media around the world suggested that American president Barrack Obama’s influence would be the factor to swing the vote decisively. However, Rio’s bid had always been based on an appeal to conscience: President Lula said to the Committee in his final address before the vote that it was “time to address the imbalance… It is time the Olympic cauldron was lit in a tropical country.” Conscience has carried the day; and many have wondered whether, in light of a recent history plagued by scandal, the IOC were ever likely to vote differently. President Obama had based the Chicago appeal on an enticing platform of US reconciliation, a chance to patch up the perceived damage that the Bush years had done to America’s standing. Inanimate revelers join in, photo by Aarti Waghela. Shock at even Obama’s failure to ‘bring home the gold’ was expressed by senior Australian IOC member Kevin Gosper. “The whole thing doesn’t make sense other than that there has been a stupid bloc vote,” he said, referring to the suspicion that many Asian representatives may have backed Tokyo at Chicago’s expense. It is a move that Mr. Gosper says could cause irreparable damage to the relationship between the IOC and the US Olympic committee. “To have the president of the United States and his wife personally appear, then this should happen in the first round is awful and totally undeserving,” he went on to say. International media are laying much of Rio’s success at the feet of president da Silva and his impassioned final presentation to the IOC, in which he demonstrated the historically unjust distribution of Olympic cities: thirty in Europe, twelve in North America and five in Asia.